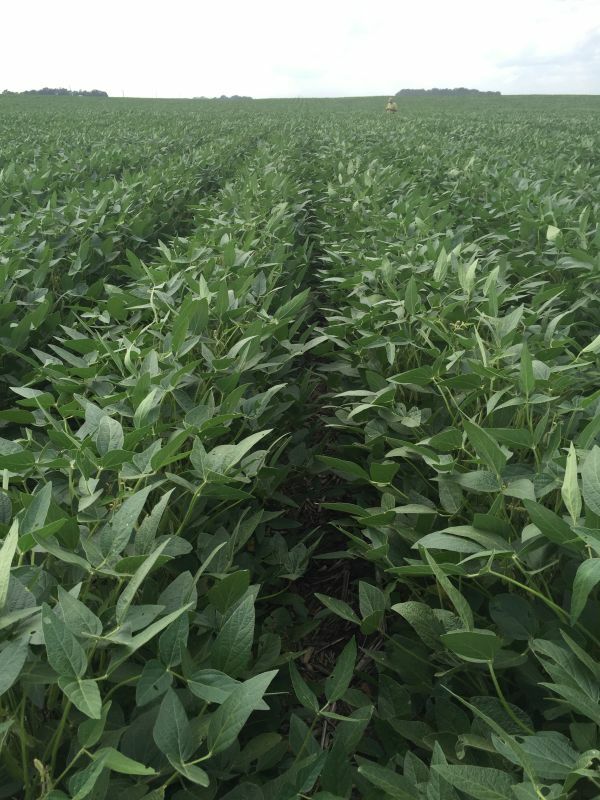 Post flooding, the beans that are left are looking great! 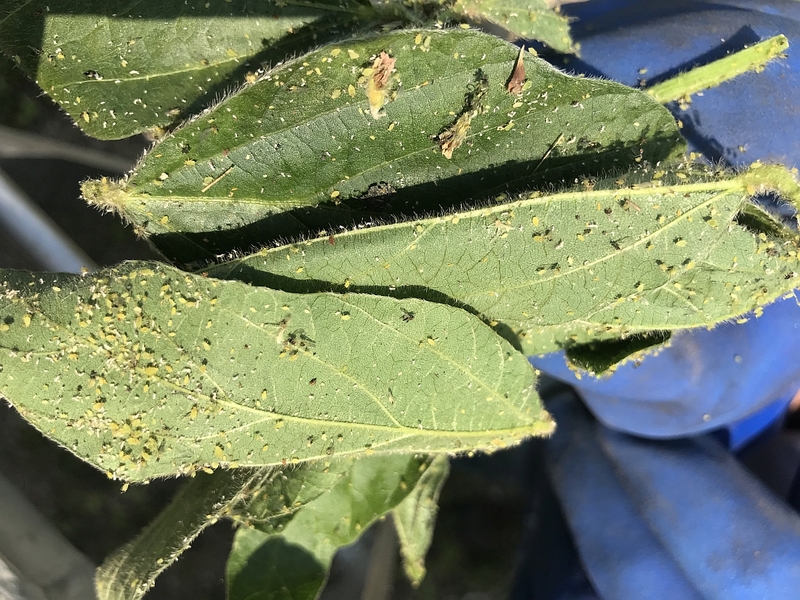 Scouting for aphids is next on the list. 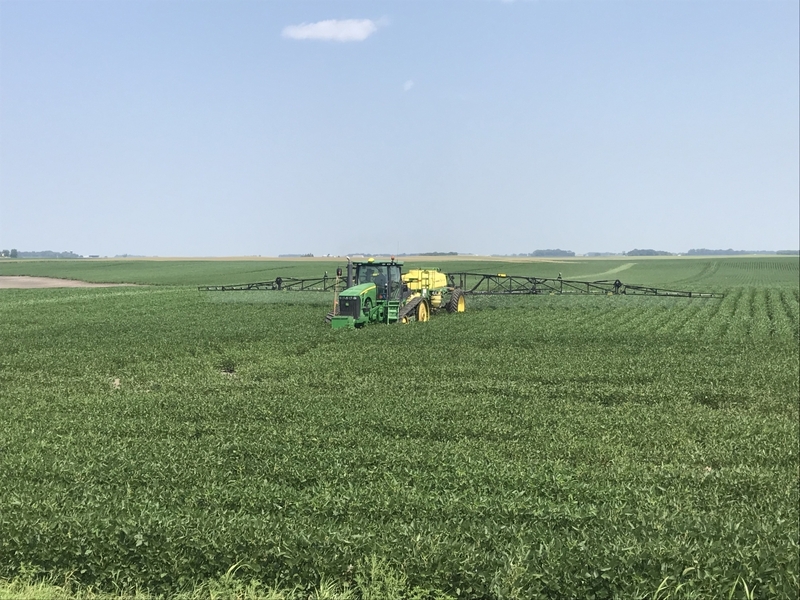 After a couple of times out, it was determined that spraying would pay off in 2018. Normally scouting is much more prolonged but the aphids were coming hard and fast with exploding populations! 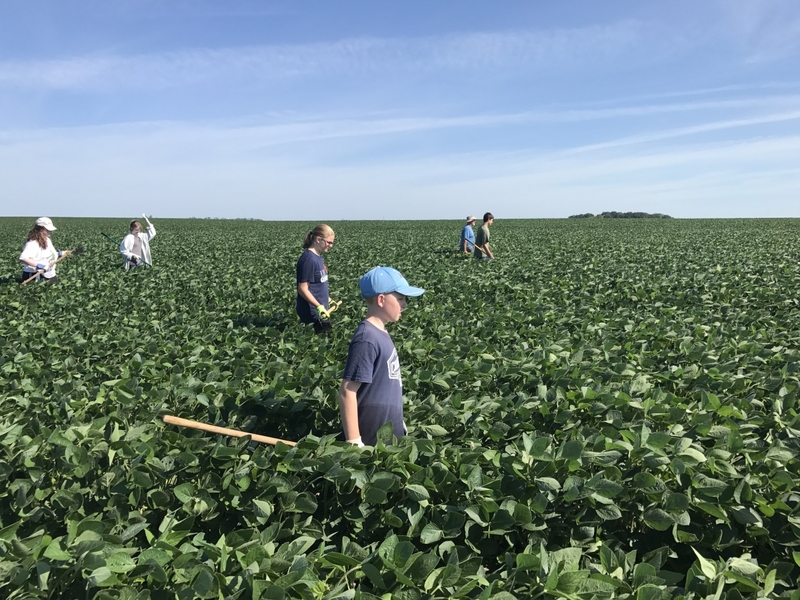 In early August we hired some kids to help walk a soybean seed field. 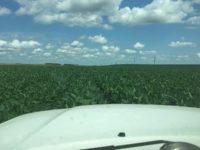 We had to get rid of the volunteer corn and some weed escapes. It was a long day that ended with a trip to Dairy Queen as an added bonus. 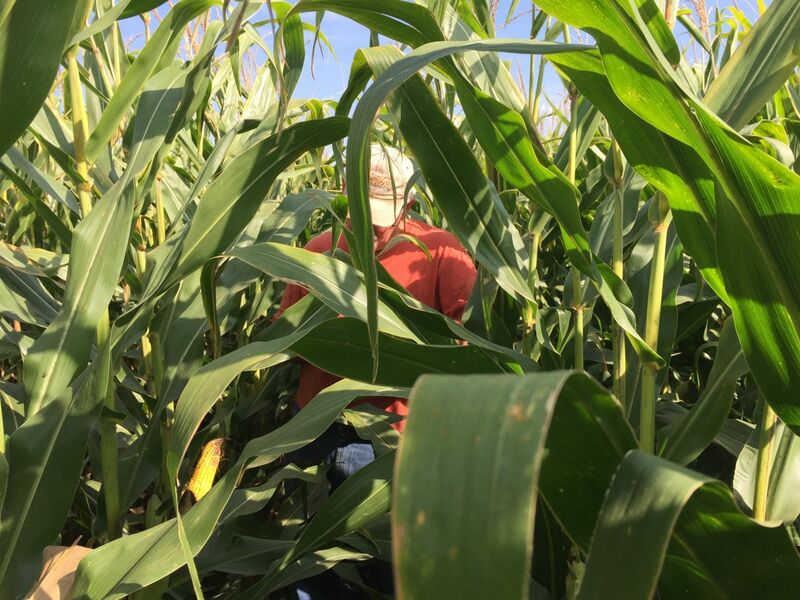 Dennis and I like to walk through our test plot pre-harvest to get a feeling for how varieties are performing ahead of combining them. The rains this year presented a challenge in getting this done in a timely manner. We exited the field with a large amount of mud on our boots. 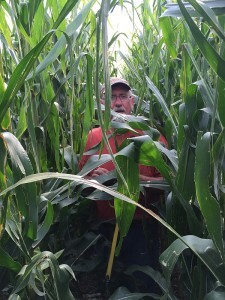 While surveying the plot we do a stand count to see what percent of our planted stand put on a harvestable ear. We also look for health problems that are presenting themselves. 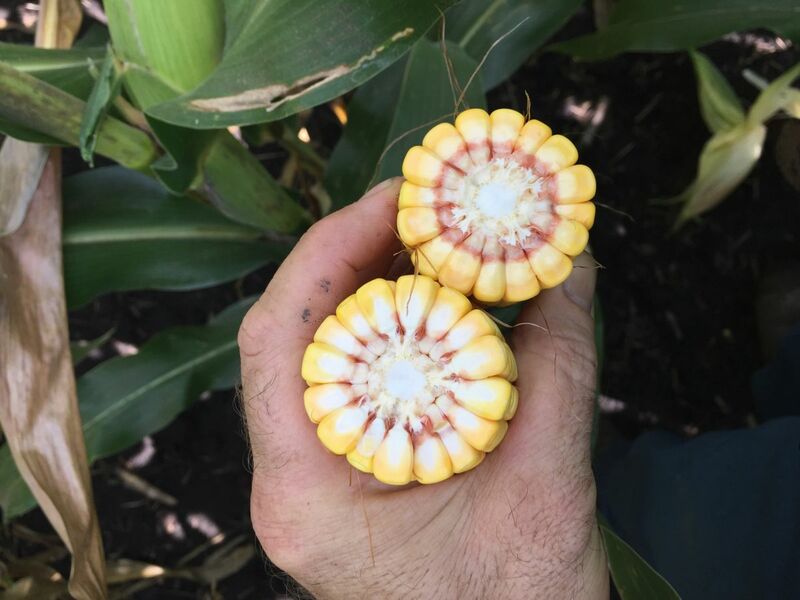 This will give us an idea of what’s going on in the fields that are planted to a particular variety that’s also in the test plot. 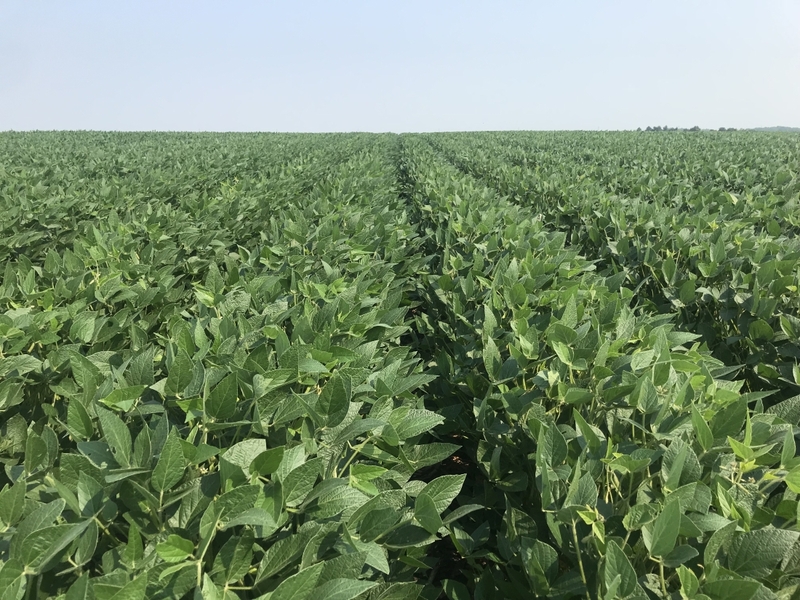 If a plant has stalk weakness or ears are already hanging down, then we know that we’ll need to keep a close eye on the field we’ve planted that variety in. If that variety isn’t in the field, we probably won’t consider it for planting another year. This is a great reason to have your own test plot rather than just looking at numbers on paper! 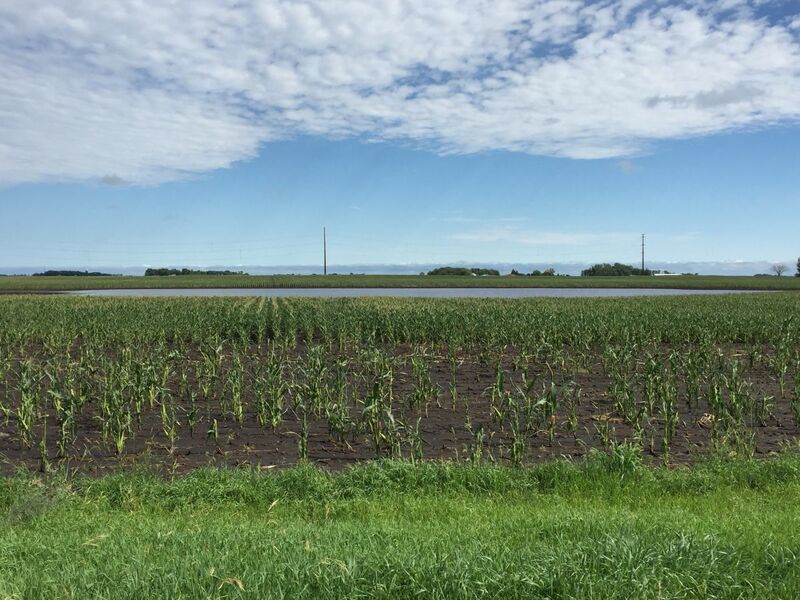 August 11 brought yet another round of heavy rains. I woke up to thunder and pulled up the radar on my phone. Here’s a screen shot of what I saw. I took a trip to our Morgan field that received hail in June as well as one other large rain event. Our low areas were once again filled to the rim with water! Crazy summer! 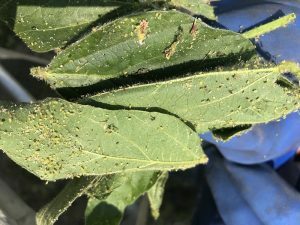 Early August is prime time for scouting for soybean aphids. 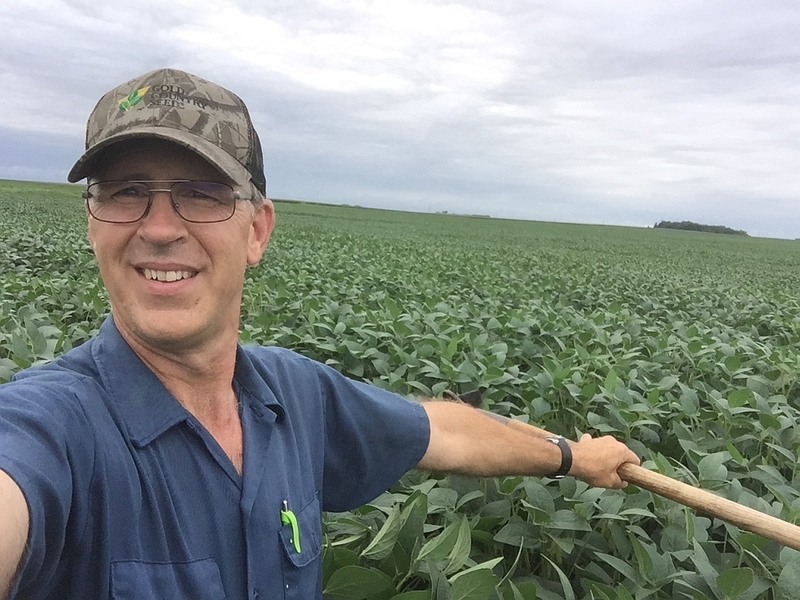 We try to get through our soybean fields with the pickup so we can thoroughly scout. Our 2005 Toyota Tundra is about 4 inches narrower than a full size pickup so it fits well down the 30 inch soybean rows. The high clearance is easy on the tall beans. 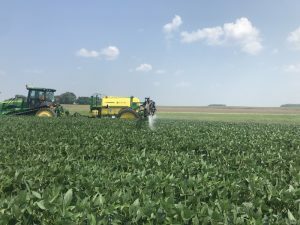 We did push it a little too late this year though and drove down some beans that were starting to lodge. 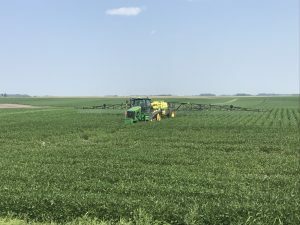 Weed control fail – not our field. On my way home from mowing road ditches I passed this field. 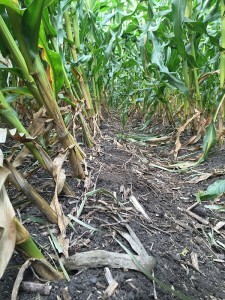 It’s a great example of what we’re trying to avoid with our weed control! 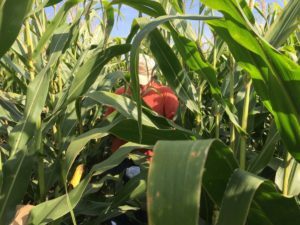 Fall is the time to evaluate our corn varieties in order to aid in decision making for next year’s planting. 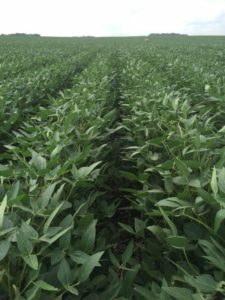 Our test plot consists of 24 – 4 row strips planted 600′ long. 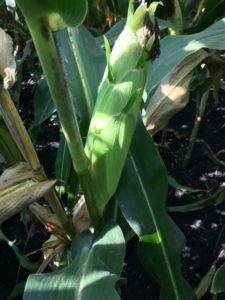 Walking through the plot prior to harvest helps us learn about the strengths and weaknesses of each variety. This year we looked at how many harvest-able ears we have per acre along with how many of the ears were significantly under sized in our opinions. We also looked at the stalks and how much goose-necking they were doing. This year presented us with some strong winds along with a round of hail. 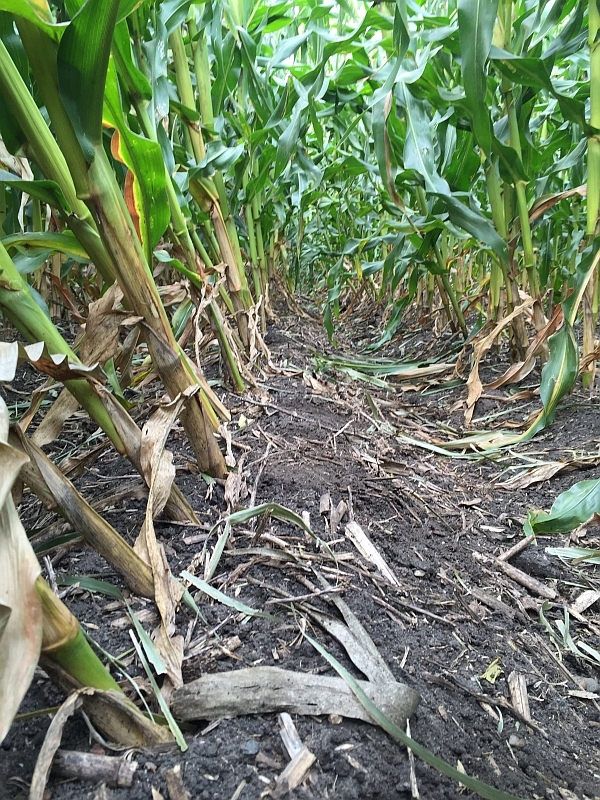 The hail damage to the corn was minimal but the wind definitely put the stalks to the test. 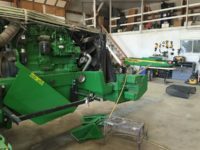 Now we wait for the combine and weigh wagon to give us the final results. 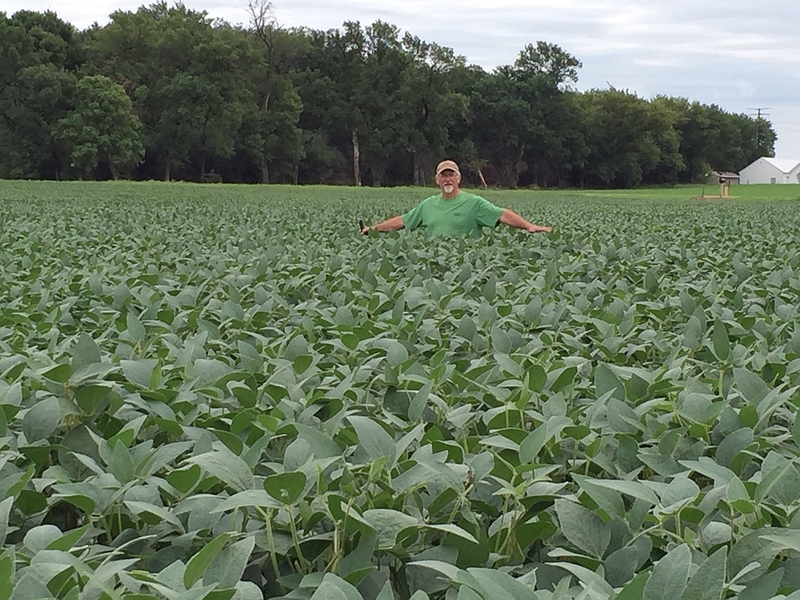 Can you say “tall beans!”? Lance in the tall soybeans. Dennis shows the soybean height. 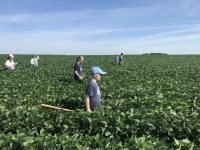 We spent part of a day last week hand weeding soybeans. It was quite the experience when we found beans up to our armpits. These are much harder to walk through but we managed. 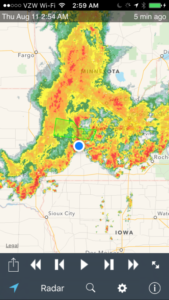 Eventually we were rained out with a, much welcomed, 2.5″+ rain over a couple of days. 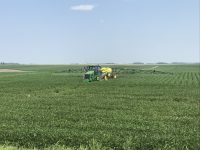 This will go a long ways in filling the pods and ears on this year’s crop. We are still finding soybean aphids in the field that we sprayed a few weeks ago. 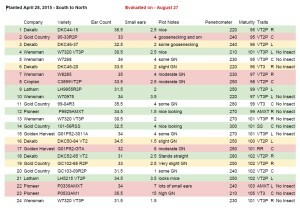 So farm the levels do not warrant a second round of insecticide. As we walked the field we also were entertained by the power company workers adding stabilizer bars to the new power lines on the north edge our our field. 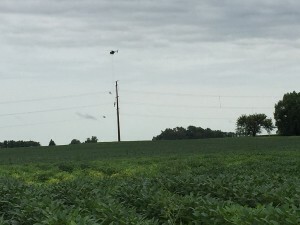 Workers dangled from the three levels of lines and attached equipment that was fed to them by helicopter. Suddenly we saw the helicopter pluck each worker off the line and fly away with them dangling on the long line. We didn’t know what brought on this sudden whisking away of the workers until the rain started to fall on us. They were keeping a better eye on the weather that I was, I guess. We spent parts of two days wandering Farmfest in search of the latest and greatest. The Gilfillan location is a convenient 15 minute drive for us so splitting our time across multiple days is quite easy. 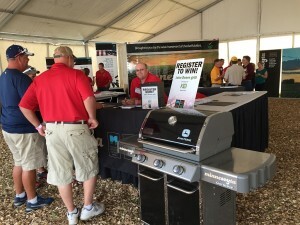 One of the highlights every year is working in the MN Soybean Growers tent talking to fellow members and educating potential new members about the benefits of being an MSGA member. Some time was spent, as well, looking at strip-till equipment. 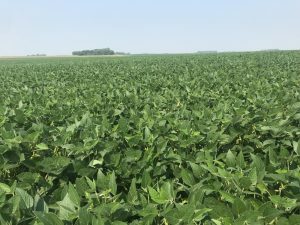 Our interest was peaked at a field day this summer in Lamberton. Much needs to be learned yet and equipment is a key piece of the puzzle. What better place to look than Farmfest. After spending a couple years looking for a replacement grain bin temperature monitoring system we finally pulled the trigger at Farmfest with the purchase of an IntelliFarms sensor system. 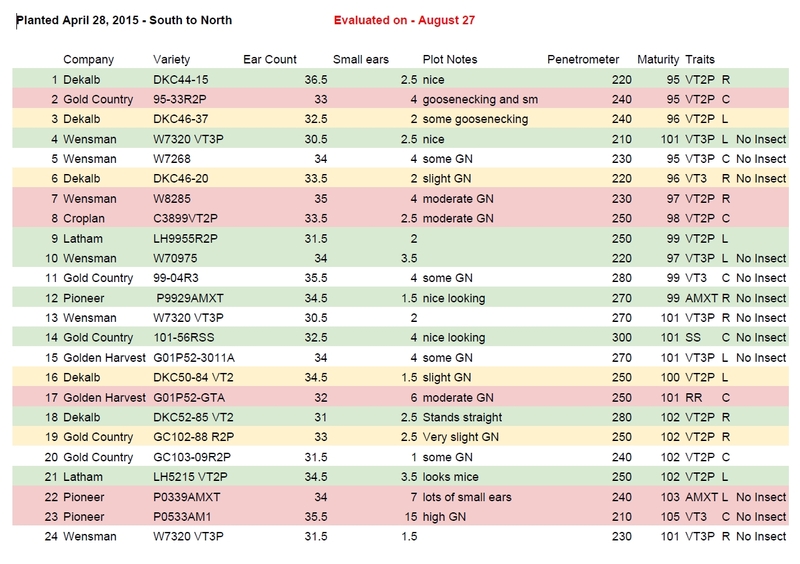 We look forward to may years of accurate monitoring of our grain to keep in in top condition. 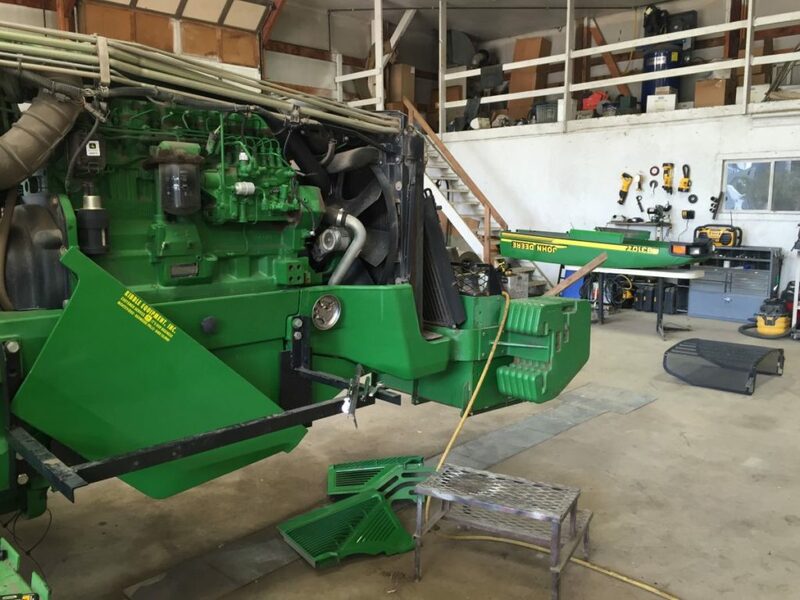 One final product we’re doing a test run on is from Farmers Business Network. 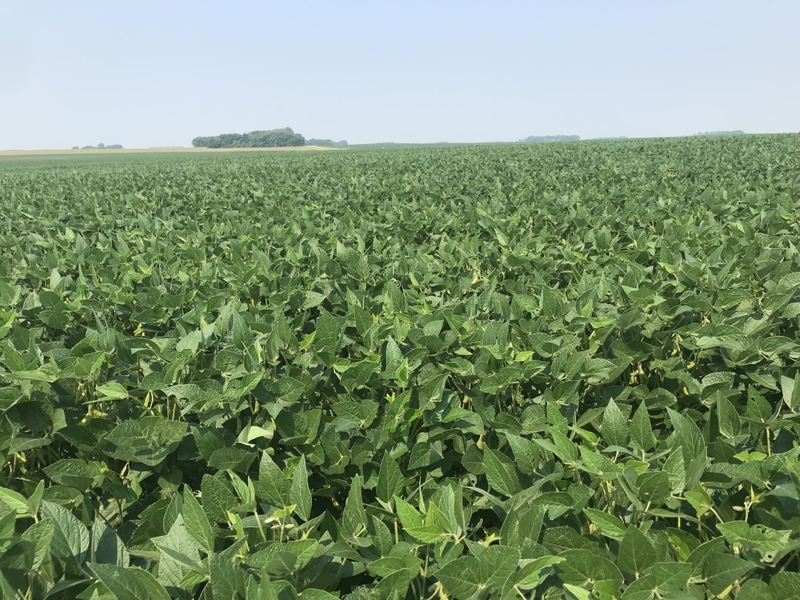 We expect this service will help us with the arduous process of choosing corn and soybean varieties for the coming year. They’re an up and coming company that is farmer focused. 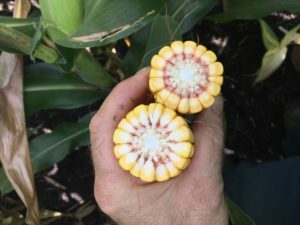 No seed or chemical company is in their back pocket. All information is for the farmer’s benefit only.